Qatar Airways offering long haul flights from £315 but sale ends tomorrow! Home » Latest News » Airline News » Qatar Airways offering long haul flights from £315 but sale ends tomorrow! Qatar Airways have been increasing their airline fleet with Boeing 787 aircraft, the huge A380 and now. 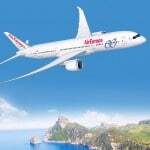 most recently, with the latest twin engine jet from Airbus, the A350. If you are an #avgeek then it is certainly a great airline to book flights with as it gives you the chance to fly on these new airliners. Take a long haul flight and you may get to fly on both the B787 or A350 and the A380. Even if you aren’t into your planes, this modern airline fleet offers great space and comfort, destinations around the world and flight prices that are very competitive. The Qatar Airways network sale is offering discounted seats in both its Economy and Business Class cabins. Flight prices start from just £315 in Economy Class and £1660 in Business Class. The offers are for destinations including Dubai, Bangkok, Kuala Lumpur and Perth. Long haul flights are never cheap but there are some great savings to be had especially to Cape Town and Bangkok. But you need to book by tomorrow! To book just click here. **Melbourne travel valid from 20th February – 30th June, excluding blackouts. ** Melbourne travel valid from 15th October – 10th December 2015.